Kirstjen Nielsen, the White House’s deputy chief of staff, was nominated by US president Donald Trump to be secretary of the Department of Homeland Security on Wednesday (Oct. 11). As secretary, Nielsen would command the massive federal agency tasked with keeping Americans safe from terrorism, and coping with natural disasters. Nielsen, 45, a longtime aide to current chief of staff John F. Kelly, is credited with helping establish order in the White House in recent months by keeping advisors with extreme positions away from Trump. During the six months that Kelly ran DHS earlier this year, Nielsen established a similar reputation as his chief of staff there. 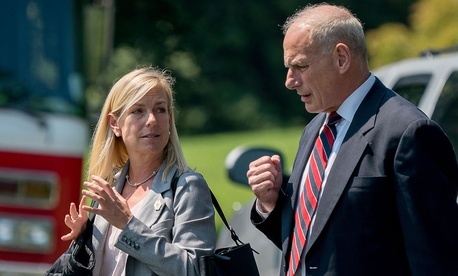 “She was the gatekeeper for Kelly,” said a former DHS official. “She wouldn’t let anyone meet with him unless she was in the room,” he said. If confirmed, Nielsen would fill a position that’s been open since July, and oversee about 230,000 employees and a $40 billion annual budget. A former lawyer and George W. Bush homeland security appointee, Nielsen has a reputation as deeply-read and detail-oriented. However, she lacks the management experience of many of the former homeland security secretaries, who were governors, attorneys general, or, in Kelly’s case, generals. Nielsen’s previous job as chief of staff at DHS means she will avoid the months-long learning curve that previous secretaries had, a White House spokesman said. “Previous secretaries haven’t been homeland security experts, and were not steeped in the issues” involved in the agency. Nielsen “understands the White House, has worked at the agency, and is prepared to step in on day one and get things done,” he said. Some were concerned, though, about her role in the government’s response Hurricane Katrina. Nielsen, then the “senior director for preparedness and response,” was among those in the US government warned in February 2005 that a major hurricane in the area could cause similar devastation as the 2004 tsunami in the Indian Ocean, according to the Senate report (pdf pg. 674) on the Bush administration’s failings during Katrina. Nielsen will have a hearing in front of several Senate committees, and then her appointment will be voted on by the homeland security committee, and the entire Senate.